In today’s birthing in Singapore, parents are exposed to lots of negative perception about birth. In modern society we live in, birth preparation becomes essential. The birth of a child is 10 times more important than planning for a wedding. Parents can help your baby to “finish” the natural process of birth in a healthy way by educating yourself with the process of birth and medical procedures in place in various hospitals in Singapore. HypnoBirthing® – The Mongan Method is a unique method of calm and relaxed natural childbirth education enhanced by self-hypnosis techniques. It is a series of prenatal classes in Singapore that based on the philosophy that birth is normal, natural and a healthy event. HypnoBirthing equips couples with a deeper understanding of childbirth, deep relaxation techniques such as specific breathing techniques for different phases of labour, visualisation, affirmation and fear release sessions. HypnoBirthing® combines science and nature. 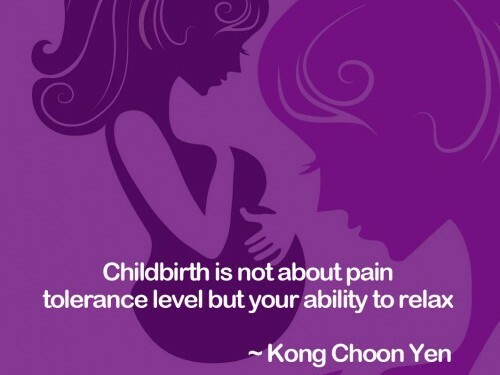 Our natural birth courses in Singapore return confidence to expectant parents by providing evidence-based information, debunks myths of childbirth, remove fears related to birthing, takes into consideration the psychological factors of the family that affect the birthing process. It prepares expectant woman and her birth companion a positive mindset with relaxation exercises to condition the mind and body towards preparing for a Healthy and the most satisfying birth and emphasizing the feeling for the baby from womb to birth. HypnoBirthing Pregnancy classes is a combination of Lamaze Childbirth Education, Bradley Husband-Coached Childbirth Method, and Hypnosis. It is presented in a fascinating series of five classes that educate, inform, inspire and empower expectant parents to birth the way they desire and that birth doesn’t have to be a traumatic event but a celebration of life. HypnoBirthing® antenatal classes in Singapore provide the missing link allows women to use their natural instincts to bring about a safer, healthier and easier birthing. It returns women the confidence in birthing by tapping into the body’s own natural relaxant, the release of endorphins, the natural painkiller 200 times more powerful than morphine; and thus reduce much discomfort and minimise the use of harmful chemical painkillers and drugs. Keeping maternal emotional outlook towards childbirth a positive one. Husband is no longer feeling helpless but learn to work with the labouring woman to welcome their baby into this world gently. HypnoBirthing® embraces a family approach involving the husband or her partner an integral role, brings the family closer. During the labouring process, the partner is taught ways to help the labouring woman to relax and stay focus so she can stay more connected to her body. Expectant parents are taught positive pre-birth parenting and emphasize on understanding baby’s feeling from womb to birth. Women learn to trust her body with her own innate power to breathe her baby down the birth path instead of forced pushing. Allowing baby enters this world in a calm and gentle manner without being frighten by the rough handling and thus reduces traumatize birth experience. Bring family closer by giving husband an integral role in the labouring process. Gain a better understanding of how the mind and emotions affect the neuromuscular body-uterine muscles works in harmony during labour when basic conditions are met. Tapping nature’s own relaxant to create the body’s own natural anesthesia. Deep Relaxation and visualisation techniques to eliminate the fear and tension that causes long labor and pain, replacing them with confidence, calm, and comfort. Exploration of the benefits of using water as a form of relaxation method in water birth. Different birthing positions for a shorter and more comfortable labor. Greatly reduces the need for chemical painkillers and episiotomy. Three special breathing techniques that allow you to work in sync with the movement fo the birthing body and to breathe your baby down into the world without the violence of hard physical pushing. Embraces the concept of pre-birth parenting. Clinical Study: 213 patients were enrolled in this study. 155 were in the midwife-led education programme and 58 in the self-hypnosis training programme. There was no statistically significant difference between the two groups in regard to participantsʼ characteristics, Gießen personality score and initial Osgood semantic differential scores. After the midwife-led course childbirth was emotionally more negatively scored (displeasure, tarnishing, dimension evaluation [p < 0.05]), whereas after the hypnosis course childbirth was emotionally more positively evaluated (pleasure, harmony, dimension evaluation [p < 0.01] and brightness [p < 0.05]). Further prospective randomised studies are required to test these initial results.